Quite literally however we house four beehives on our roof and have become quite the residence for many welcome rooftop honeybees. Jam Factory works closely with Roof Top Honey, the team behind this environmentally friendly initiative. Their mission is to bring bees back to the city and suburbs of Melbourne and contribute to a global effort; helping to save the honeybee from various threats and facilitate its prosperity around the world. 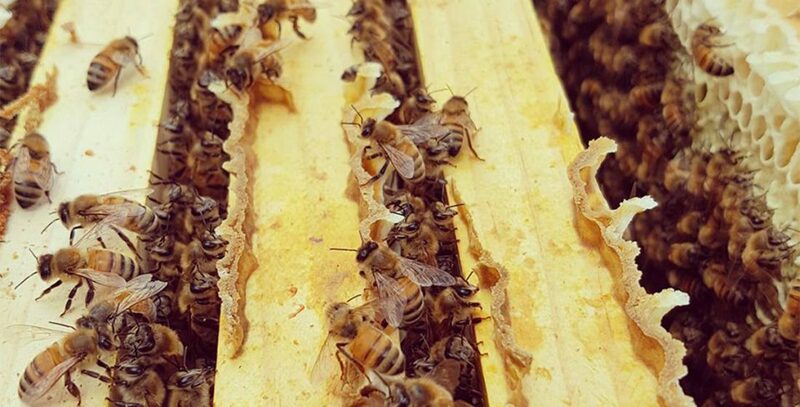 Jam Factory is one of more than 70 venues throughout Melbourne which hosts beehives, helping to nurture the sustainability of these hard-working, life-giving creatures. These humble and hardworking buzzing bugs provide an invaluable pollination service by pollinating about one-sixth of the flowering plant species worldwide and approximately 400 different agricultural plants, not to mentioned the floral beautification of our local landscapes. Melbourne City Rooftop Honey joins cities including Paris, London, Toronto, San Francisco New York, Hong Kong and many others where urban beekeeping is thriving. The community benefits include the production of true local produce – a delicious tasting honey unique to the City of Stonnington ­– not to mention it helps keep the City of Melbourne green. As we see it, every little bit counts when it comes to saving our environment. Jam Factory is a leading Melbourne retail destination on Chapel Street in South Yarra. Jam Factory is home to some of Australia’s best retail stores, cafes and restaurants. Jam Factory is where the high-street meets high-end and a retail love affair is born. Jam Factory presents a curated mix of fashion and food retailers all in the heart of Chapel Street South Yarra.